The modern fleet were all built in 2016, ensuring you have a comfortable crossing. All the fleet are equipped with the latest modern safety equipment including a state of the art GPS system, life jackets for all on board and the skilled crew are all fully qualified to operate the ferry and assist you on your smooth sailing. Each crossing only takes 30 minutes and every ferry in the fleet contains enough room for 50 passengers on each voyage. With directferries.co.uk you can find Buva Sea Cambodia timetables, fares and book Buva Sea Cambodia ferry tickets. 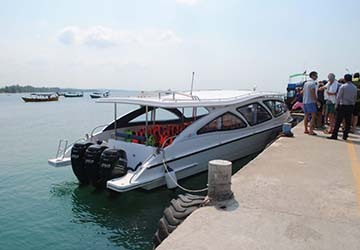 Where applicable we’ll also compare Buva Sea Cambodia with alternative ferry companies.